As a thank to everyone who has supported us, followed us and purchased or downloaded as products, we have decided to release a FREE font bundle. This free fonts pack consists of 16 awesome typefaces, as well as a complete commercial license for every product included. But hurry this pack is only available for download for 14 days. Once its gone, its gone. Caroline is a beautiful new font with a beautiful name! A script font that has a straight baseline and a slight italic slant. 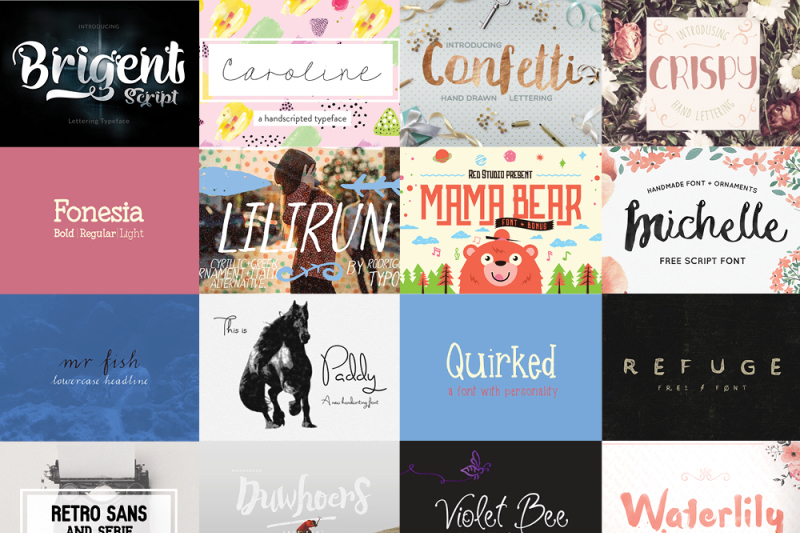 Perfect when combined with one of the chunky monkey fonts also included in this bundle. Why not try Mama Bear? This gorgeous typeface won't be found in free font bundles anywhere else. 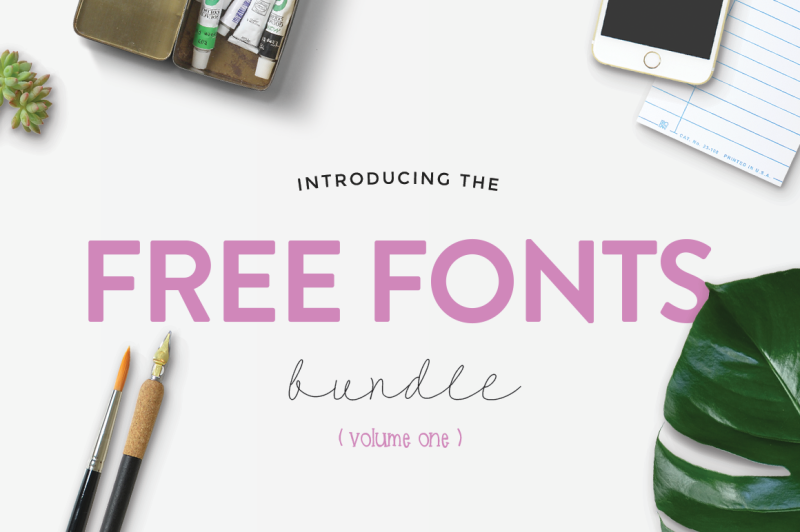 The second item included in our free fonts pack is Michelle. Michelle is a beautiful font that includes some very pretty ornaments! The swashes and swirls included are fun and fabulous! The irregular baseline adds a little something extra that just makes the font more adorable. Fonesia includes three font versions, the regular version, a thicker bold version and a thinner light version. All three work very well with each other and are extremely legible at any size. Great for easy reading and with a modern twist on classic serif fonts. Mama Bear is a grizzly font that looks like a bear has literally carved it with his/her bare paws! Great for all of your outdoorsy designs and for adding an extra Grrr to your work. Quirked is, well, quirky! A slight irregular baseline, thick lines, and irregular curves make this fonts name very apt! There is something so delightfully childish about this font that we simply love it! Violet Bee is a hand drawn, quirky and fun looking font. It can be used for a wide range of projects, such as logo designs, party & wedding invitations, t-shirt designs, signs, magazine design, greetings cards, poster design and much more! A rough and ready font that doesn’t mess around! Bold, edgy and a real stand-out typeface free from the restraints of conformity. A useful font to incorporate into your design toolbox. Confetti is so much fun to play with and frankly one of the parts everyone looks forward to at any wedding! Why not stick with the theme and use this font on the next wedding invites you design! Duwhoers is a super font that we can’t get enough of! Very original and thoughtfully created by the genius mind of Swistblnk Design. We know you’ll love it as much as we do! Lilirun includes some really snazzy dingbats including lightening bolts, hearts, banners and swirls. The font itself is a tall, thin, rough font that oozes cool. Lilirun is bound to be a fan favourite, just like Rodrigos previous fonts! Another typeface, not included in any other free fonts bundle on the net. Brigent is a fantastic font that includes hundreds of glyphs which are all accessible via either your glyphs panel or character map. We love that more designers are encoding their fonts so that everyone can access all the goodies without needing pricey software and this fabulous offering is no exception! Paddy is an original monoline script font with over accentuated curves that create depth and height. Paddy enjoys being paired with thick, bold fonts to compliment his thinner floatier strokes. Retro is so retro that we are having a bit of a throwback week in the office and listening to all of our old favourite songs and cracking out fonts that we haven’t used for years. Retro includes two versions, a sans option and a slab serif option! Mr Fish doesn’t need much of an introduction. He keeps himself to himself with his soft flourishes and strict lines. Use him in your designs and he’ll be grateful and he promises to add that extra va-va-voom as long as you call him sir. Waterlily, a pretty font that has some added ink splashes on certain characters. A bit messy and irregular and full of charm! A beautiful flower and an even more beautiful font! Enjoy it! I hope you all enjoy using our free fonts pack. The wonderful combination of thin and thick on each letter is really unique and adds to this fonts quirkiness! Crispy will compliment your designs in a modern and perfectly imperfect way!